Tattoos that show your personality are some of the most popular types of ink, and barbed wire tattoos are certainly tops among these patterns. Show your strong inner self with this spiky art. Barbed wire is also known as barb wire, and it is a type of wire fencing that is often used to secure property so that animals (and people) cannot get in or our of a certain area. The barbed wire literally contains barbs, or sharp spikes, that will pierce the skin of any animal or man that tries to climb over or run into the fencing. Barbed wire was developed in 1874, and it quickly became the fencing of choice for farmers, who needed an inexpensive and effective way to fence in their animals - especially cattle. It's often said that the Wild West was not tamed or won by man, but rather, by barbed wire. The invention of this material allowed farmers to keep their cattle safe from running away into dangerous territory, and it also kept rustlers and other criminals from being able to steal the animals. Many people cite barbed wire as one of the most important inventions of the 19th century. In the early 20th century, barbed wire became an important part of trench warfare in World War I. Today, barbed wire still holds animals safe, but it is more often seen in human situations. In areas where people need to be kept in place (prisons and other penal institutions), looped coils of barbed wire or razor wire are usually seen at the top of the fences surrounding the area. This is a great deterrent to anyone who's thinking of escape. Most people who choose to get barbed wire tattoos do so because of the association with strength and tough attitudes. Barbed wire is known for being extremely strong and prickly, and a tattoo of this material can show that the wearer is just like that material. Barbed wire tattoos are popular as biker tattoos, and they are often seen along with flames on the upper arms of men who want to show their strength.Some people choose to get barbed wire tattooed on themselves because of the association with the Wild West. If you are interested in Western themed tattoos but feel that a cow skull or horse tattoo is just a bit too overused, barbed wire is a good way to show your affinity for the West without going overboard. Generally, barbed wire tattoos are done in shades of grey and black. There is really no color found in actual barbed wire, so most artists choose to stick to black ink. Patterns can vary from the usual twists of steel wire with pointed barbs at specifically spaced stations, to more intricate barbed wire designs. The design used for actual barbed wire has changed over the years, and there are many different patterns to choose from. Additionally, you may even choose to get a barbed wire tattoo that looks as if it's poking into your skin, complete with blood drops. These tattoos can be representative of pain and torment, instead of just the usual connotation. Barbed wire makes for a natural band, so most people choose to get their barbed wire tattoos around an appendage, instead of in a spot like the back or chest. Many people get their tats around the upper arm, such as in the case of Pamela Anderson, the owner of perhaps the world's most famous barbed wire tat. 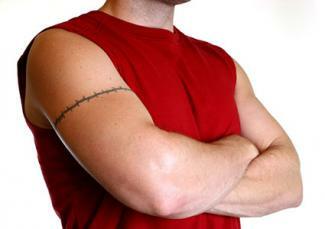 Men are more likely to be seen with this particular tattoo, however. Other spots where barbed wire can be seen include around wrists and ankles - perfect places for a bracelet of wire and spikes.